Earliest memories are from the late 1960s. 2 cylinder tractors still very much a part of farming, having been discontinued only 8 or 9 years earlier. Watched mounted pickers harvest the corn crop. Saw pull-type combines harvesting soybeans. More progressive farmers ran self-propelled combines. Such self-contained equipment was new and exciting for his family farm operation. His farm's first tractor with over 120 horsepower was huge, and the thinking was a larger tractor would never be necessary. Watched as equipment went from 4 to 8 to 12 to 16 rows in capability. Progression witnessed from 4 and 5 bottom plows to current 8 and 9 bottom plows, 30 foot chisel plows, and 26 foot discs. Introduction of Articulate 4-wheel drive tractors was impressive in terms of added productivity being given the farmer. Grain drying capabilities have changed from picking corn on the ear, drying it in cribs, shelling it with a portable sheller that was hired by individual farmers to storing and drying shelled corn in bins on the farm, and unloading it when needed for grinding with feed or for transport to market. This type of technology arrived on his farm in the late 1960s and early 1970s. Feels that seed hybrids, pesticides and herbicides have resulted in large productivity increases for farmers, especially in the 1980s with the introduction of GMO (genetically modified) varieties. He was interested in how adjustments were made to equipment, how seed was selected, use of insecticides. Was introduced to low impact farming through his contact with local residents in farming community. Talked 1 on 1 to customers when equipment was being worked on. Even though some local residents never got past high school, they were very intelligent and understood finances. In these ways, he was able to learn both new and old school thoughts, choosing which ones he wanted to apply to his own life situation. Participated in on the job training. For example, worked in a salvage yard operated by John Deere. At this location, he was able to work on Pre 1960 2 cylinder tractors. Was involved in painting tractors. Says he got to where he understood them. Whenever a 2 cylinder arrived, he got opportunity to work on them because more senior mechanics wanted to work on newer modals. Eventually moved into the parts department to expand his horizons. (Hands never really healed) With a friend, began to locate rare equipment parts. 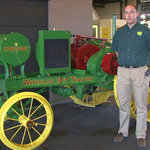 Friendship led to establishment of the John Deere Collectors Center in Moline. Now In charge of day to day operations. Center is actively working on restoring tractors in the shop. Responsible for the finances and ordering of parts. Authenticity of parts is important.